Red lips, eyeliner flicks and ebony victory rolls … mix these ingredients together; blend with a massive wardrobe of swing dresses; add a dash of sass and a bucket of glamour and who do you have? 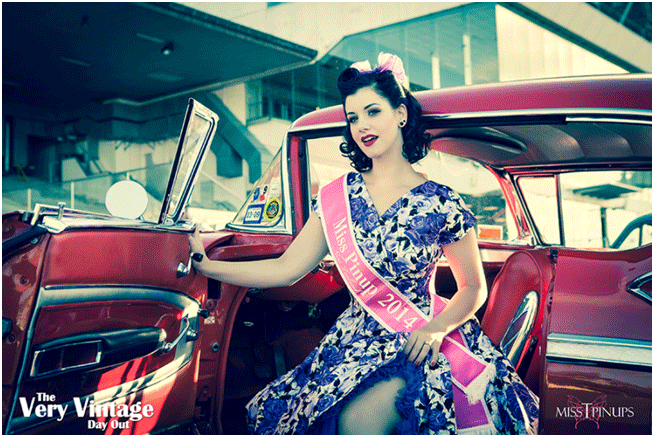 Why you have Miss Victory Violet of course- crowned Miss Pinup NZ 2014! 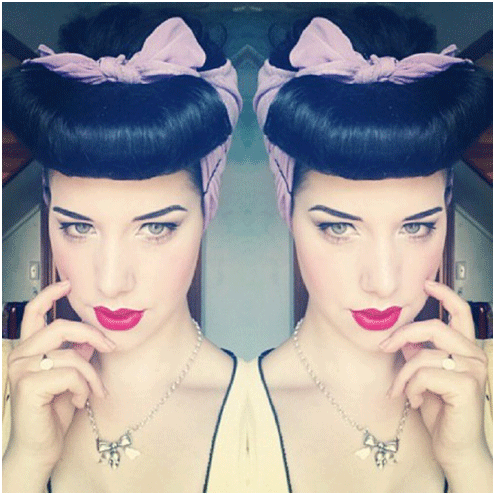 Miss Victory Violet is a raven-haired beauty from Auckland who describes herself as a pinup model, hairdresser, wife, Disney geek, Lindyhopper and lover of all things pinup and vintage. For those who haven’t yet met Miss Victory Violet, prepare for a thoroughly modern, yet gloriously vintage, vixen! Ella Webster is the gorgeous young lady behind Miss Victory Violet. Ella, congratulations on being crowned Miss Pinup NZ, and I believe Miss Picture Perfect as well! I’m assuming, and to be honest even hoping a little (!) that you don’t just wake up looking like the uber-glamorous Miss Victory Violet, and that she takes some creating of a morning. Most pinup personalities have an alter-ego and of course Miss Victory Violet is yours – seeing this interview was initially written for the lovely ladies at Makeup Obsessives, I’d love it if you would answer some questions for us about the role makeup has in the creation of Miss Victory Violet . Q1. Your makeup is clearly styled in the classic pinup genre; if you had to pick three makeup elements that were totally necessary to achieve your look, what would they be? A. Definitely red lips and liquid liner with a big flick! And the one that some people don’t do is defined eyebrows! They make such a difference to the overall look… as long as they are done well and not square or pencil thin! A: Red lips are quite high maintenance and you have to be prepared to check and reapply after eating or drinking. There are ways to increase the longevity of your lippy though! When I apply red lipstick I ALWAYS apply concealer to my lips first, then powder, use a lip liner all over the lips and then apply the lipstick. This not only helps to get the true colour of the lipstick but helps it last longer and avoid bleeding. My favourite shades are Besame Red Hot Red and Natio Rush. Always blot after application so you don’t end up with a red smile! There are also a lot of matte lipsticks on the market which also have great staying power, if you don’t mind the dryness. MAC Ruby Woo and Lime Crime Red Velvet Velvetine are my two matte favourites but I do find that I have to apply a regular, more moist lipstick after a few hours to stop feeling so parched! Q3: OK … so we’ve got the red lips covered … now we want the inside running on the eyeliner flicks! Your favourite product/s? And of course, 10 different, 100% fool-proof methods of applying it evenly? And please don’t suggest you freehand it … we WILL take your firstborn child! Don’t use those felt tip pen liners – they never seem to come out highly pigmented. I mostly use Rimmel Glam Liquid Liner and also have MAC Black Track Gel Liner. I use the MAC one in the inner corner of my eyes as it is more waterproof and doesn’t transfer to my lower lid as easily. I highly recommend using a liquid liner with a very fine brush- that’s why I use Rimmel! It’s impossible to get a nice pointy flick with a fat tip! I always apply my liquid liner with my eye open, that way I can shape it to my eye easily and make sure it’s even and matching the other eye. I usually start in the middle and work my way into the inner corner of my eye. Then I will draw the flick. Some days the angle is spot on, sometimes not! I just start in the corner and draw it up, aiming for the end of my eyebrow. Then I fill it all in! My eyeliner is always thicker than I initially want it due to going back and forth between each eye trying to make them match! Q4. Start to finish … how many products do you use on your face to create Miss Victory Violet? A: Antipodes Cleanser and Moisturizer, MAC Prep and Prime, MAC Matte Gel, MAC Matchmaster Liquid Foundation, MAC Studio Fix Powder, 3 eyeshadow shades, liquid liner, mascara, black eyeshadow for brows, highlighter, contour, blush, concealer, lip liner and lipstick. Q5: Is there one product, that once applied, makes you think “yip, there she is … Miss Victory Violet” or is she a combination of hair, makeup and outfit? A: It’s really a combination of hair and makeup! I love getting ready in the morning and putting together my look! Q6: As gorgeous as she is, Miss Victory Violet is a high-maintenance lady … do you have a five-minute “go to” look that you employ for occasions when you need to roll out of bed the morning after a big night out and pop down to the local dairy for a restorative fatty girls pie? A: Believe it or not, I do have jeans! On my days off when all I am doing is hanging around home or going to the supermarket, I will just wear jeans and a t-shirt. I won’t do my hair or makeup because I think it’s good to give your skin at least one rest day a week! Q7: If you don’t mind me saying, your look seems inspired by the glorious Dita Von Teese (hmmm … why did I ask that … I’d give my right kidney to be told that?!) Is she your style inspiration? Are there others? A: Yes, Dita has inspired me over the years, I guess since she is more mainstream, she was someone who I used to look at as a teenager and wish I could be like her! I take a lot of my inspiration from Instagram – I love finding someone new who dresses in the vintage style and puts together amazing outfits! I love Doris Mayday for her hair, outfits and modelling style and she is so lucky to have Tony Medina do her hair all the time! He is just amazing! A: Ohhh that’s hard! I have to pick my hair spray – Davines No.7 Crystal Fixative Lacquer. It has so much hold but it’s also super shiny and smells amazing. It’s been discontinued by Davines and the replacement just doesn’t cut the mustard. I don’t know what I am going to do without it so I’m stocking up! A: I’ve recently discovered MAC Matte Gel- I mix it half and half with MAC Prep and Prime for a lovely velvety matte finish. It keeps the shine away all day! Q10: Table of eight; you and your husband and six other people (living or dead) … who would they be? Q11: If there was a “makeup time capsule” to be opened in 50 years time, what product would you put in it and why? A: Probably my favourite red lippy – Natio Rush – because knowing how lipstick colours come and go, it might not be around anymore! 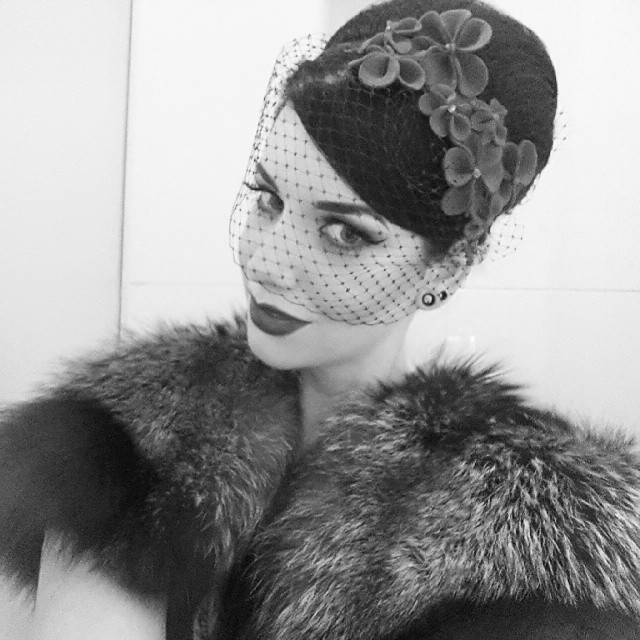 Thank you so much for your wonderful answers @MissVictoryViolet @MrsEllaWebster @MissPinupNZ2014 … it’s been grand! 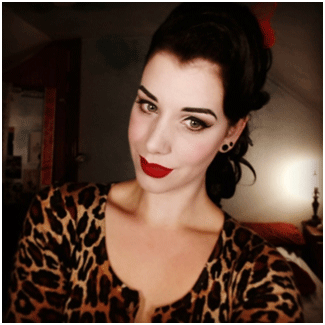 Posted on October 7, 2014 November 25, 2014 by MumptyStylePosted in Burlesque/Pinup, Mumpty Q&ATagged 50's glamour, Antipodes, Besame, body confidence, Dita Von Teese, Doris Mayday, eyelashes, eyeliner flicks, False eyelashes, Flipagram, lashes, lipstick, liquid lipstick, MAC, makeup, Makeup Obsessives, Marilyn Monroe, mascara, Miss Pinup NZ 2014, Miss Victory Violet, mumptystyle, Natio, pinup, Q&A, red lipstick, Rimmel, Velvetines, victory rolls, vintage.